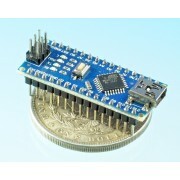 Arduino Compatible Development Boards. NanoAT. Sensors, motors, converters, ADC, DAC, PWM, displays, instruments, AVR, ARM Cortex M0 M4, RAMPS. NanoAT Arduino Nano Compatible ATMega128P Version 3.0 Atmel Atmega328P-AU MCU with..